Whether it’s at home or in the work place, the presence of asbestos can pose many safety risks. Asbestos was commonly used as a building material in Australia between the 1940s and late 1980s, as it was durable, fire resistant and an efficient insulator. Today, asbestos is no longer mined or used in Australia because of the associated health risks, however it is still present in many old Australian homes and other buildings. In this article we outline the places asbestos can be found, its associated health risks and diseases and the importance of safe, professional removal. What is asbestos and where is it found? Asbestos refers to a set of six naturally occurring fibrous silicate materials. There are two main types of asbestos found in construction, bonded (non-friable) asbestos and loosely bound (friable) asbestos. Bonded asbestos is common in residential buildings and is usually found in the form of fibro sheeting, guttering and downpipes, roofing, shingles and eaves. It can also be found in insulating boards, which may be present in circuit boards, electrical panels, ceiling tiles, wall linings and partitions. 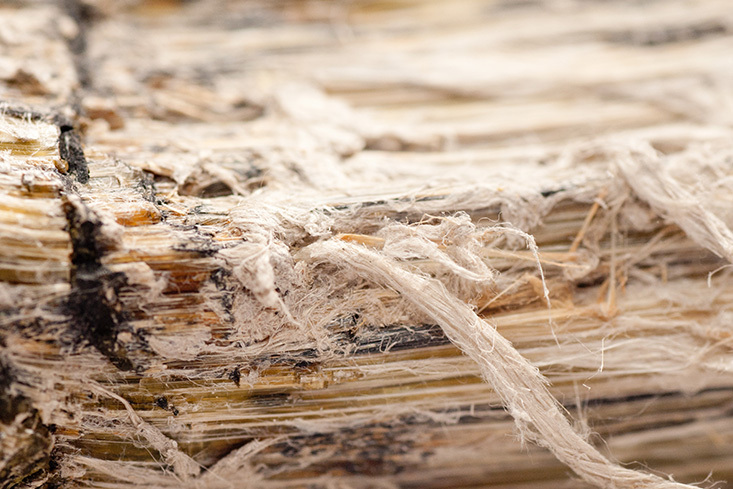 Loosely bound asbestos is primarily found in commercial and industrial settings, where it was used for fire and sound proofing, and insulation. It can, however, be found in domestic settings in old heaters, stoves, hot water systems and piping, as well as in ceiling insulation and vinyl and linoleum floor backings. Loosely bound asbestos crumbles easily when touched, which can result in the fibres becoming airborne. For this reason it is considered highly dangerous and must not be inhaled. Bonded asbestos is considered to be less dangerous than its friable counterpart, however it can still be a health risk if it is degrading or crumbling. Inhalation of asbestos particles or fibres is extremely dangerous and can result in, or contribute to, a number of serious health conditions. Asbestos can cause scarring (fibrosis) of the lung tissue, which can result in a chronic lung disease called asbestosis. Asbestos is also a factor in certain carcinomas (a form of cancer), especially lung cancer. Perhaps the most serious disease linked to asbestos is mesothelioma – a rare malignant cancer of pleural membrane tissue around the lungs. This form of cancer can also occur in the lining of the abdominal cavity, or on the lungs or reproductive organs. While surgical removal is possible in early diagnosed mesothelioma, symptoms do not usually present themselves until the disease is advanced. Barring surgical removal, there is no cure for mesothelioma and although symptoms can be relieved, it is ultimately fatal. Asbestos is also associated with non-malignant conditions such as pleural plaques, pleural effusion and diffuse pleural thickening. The safe removal of asbestos is extremely important, both in commercial and residential areas. While homeowners are allowed to remove bonded asbestos from their property themselves, they are still required by law to dispose of it at a designated disposal site and should be well informed of safety precautions and potential health risks. Loose asbestos, however, must always be removed by a licensed removalist. Asbestos in the workplace must be removed by a licensed removalist whether friable or non-friable. Removalists are given either a Class A licence, allowing them to remove all types of asbestos, or a Class B licence, meaning they can only remove non-friable asbestos. It is extremely important for workplaces to act within compliance when removing asbestos. If you suspect your there is any asbestos present on your property, contact Alpha Environmental today. We specialise in asbestos testing and can manage the removal of any asbestos present in your home or workplace if necessary.